Plans to extend the opening hours of Vivid nightclub have been met with fierce objection from some neighbours. The High Street nightspot wants to open two hours later in the week and serve drinks for an extra hour-and-a-half at weekends. It would mean clubbers leaving the venue as late as 3.30am on Fridays and Saturdays. We already suffer great disruption to our sleep and anxieties about our property as violence is a regular occurrence. In March 2009 I opposed the opening of the club and my concerns about it have been proved to be repeatedly correct as each weekend noise levels in my street are deplorable and the violence is shocking. My wife is ill with chronic kidney disease and rest is crucial to her well-being, thus she has taken to sleeping on a sofa bed at the back of the house so that she can get the rest she needs at weekends. It is looking likely that my family will be forced to move house in order to have a reasonable quality of life. Is that fair or right? 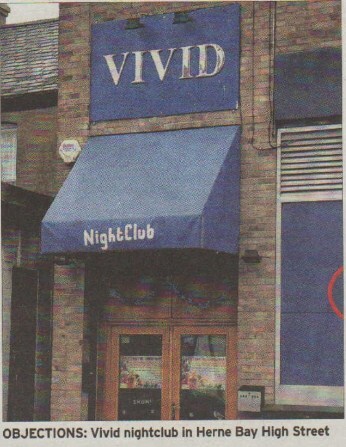 Formerly Planets, Vivid is the only operating nightclub in Herne Bay, with seafront venue Talk closed for refurbishment. I have recently suffered lots of disruption from the club, including noise, vandalism to my car and experiencing just last week an act of violent behaviour just outside my house. The nightclub staff only seem to intervene when it gets to the point of the police and ambulance being called. This disruption is having a great impact on my life to the point where I have had to seek medical help for my lack of sleep and stress caused by this. I can also see these extended hours having an impact on the police in the area as they are going to be in more demand also. Although I have objected in the past, having received complaints from numerous residents, I have not received any further objections recently and am under the impression that this night-club is being well run. A licensing committee will meet at the Guildhall in Canterbury on Tuesday to decide whether or not to grant the application. People go out and about later than ever before and we need to cater for that. It’s difficult to compete with the local competition, like Talk and nightclubs in Canterbury, when they have late licences. We’re just trying to do the same as they are – to keep people in the town locally. Commercially it’s difficult to make a business when you’re restricted differently to others. “It’s simply not true. We run a nice organisation and we feel we offer something to the community. There have been problems outside and one or two have involved people from the club, but the majority have absolutely nothing to do with us. We can have the doors closed, the shutters down and be having a cup of tea upstairs, but any trouble outside is associated with us. It’s just not the case. The police have been monitoring the premises and we’ve had no complaints or issues with them. They and the council are completely happy with what we’re doing. Our doorman even helps to keep the street clean, safe and tidy.